Unsuspecting New York City bicycle courier Wilee is given a dangerous package to deliver by his ex-girlfriend Vanessa's roommate, Nima. Wilee isn't aware that the package contains a ticket worth 50,000 dollars that will secure a trip for Nima's family on a smuggler's boat out of China and to the United States. Loan Shark Mr. Lin wants the ticket to cash it in for the money it's worth and hires a gambling NYPD officer, Bobby Monday, who owes him money to retrieve the ticket in return for a forgiven debt. Monday confronts Nima who admits to having handed off the package to Wilee. Vanessa arrives after Monday's left and Nima tells her about the package and its precious contents. Monday finds Wilee before he leaves and threatens him but Wilee escapes and goes to the police station, only to find that the man he's attempting to report is an officer. Wilee goes to his dispatcher and demands that someone else deliver the package. He ends up giving it to his rival, Manny, who follows a false call from Monday to change the drop off address. Wilee runs into Nima who explains what was in the envelope and, feeling guilty, Wilee tries to get the ticket back from Manny who refuses. The men race one another, pursued by a bike cop who tackles and arrests Manny just as Vanessa appears and hands over Manny's bag containing the envelope to Wilee. Wilee is run over by a taxi and is unfortunately put into an ambulance with Monday who forces him to give up the envelope in exchange for his bike. Wilee lies and tells Monday the envelope is in Manny's bag and Vanessa meets Wilee at at the impound lot to get the envelope hidden in his bike's handlebars. On a stolen bike and chased by Monday, who realized he's been fooled, Wilee takes the envelope to the correct drop address. Nima makes a call to Mr. Leung, the man who sold her the ticket, and he dispatches his enforcer to help. Monday catches Wilee and intends to kill him but Vanessa arrives with other couriers and they distract him so that Wilee can deliver the package and a call can be placed to ensure Nima's family's place on a ship. Monday is gunned down by Leung's enforcer. Meeting up with Wilee and Vanessa, Nima receives a phone call from her mother saying that they were on their way to America. 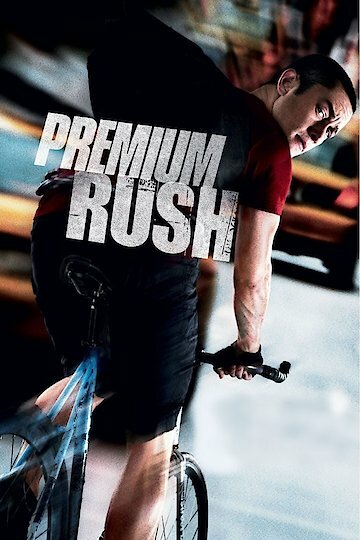 Premium Rush is currently available to watch and stream, buy on demand at Amazon, Vudu, Google Play, FandangoNow, iTunes, YouTube VOD online. The summer is winding down, but there are still a few more offerings as far as summer action movies go. And then there's an anti-Obama political documentary. Weird.